Old Town State Historic Park in San Diego. 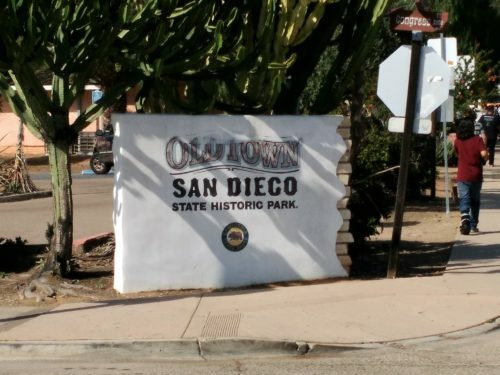 SAN DIEGO–On April 13, Old Town San Diego State Historic Park is hosting an Earth Day Open House themed around Climate Resiliency. The event, which takes place from 10 a.m. to 3 p.m. features participates from State Parks, Parks Champions, Park Volunteers, Cal Fire and California Fish and Wildlife as well as other community organizations. There will also be games and crafts for children, as well as guided tours of the Native Plant Area by volunteers from the California Native Plant Society. The Earth Day Open House is made possible by an $8,000 Earth Day Grant received through the California State Parks Foundation. “We are excited to be one of just 5 state parks to receive an Earth Day grant. This is a wonderful opportunity for us to raise awareness for not only Climate Resiliency but also of State Parks and their unique features and recreational activities.” said Tim Downing, Volunteer Coordinator for the Park. “With the record-breaking temperature rises, historic droughts and wild fires, it’s important for everyone to think about what they can do not only in our parks but their homes, communities and the environment. We are bringing not only members of the Parks Family together but also members of the greater San Diego community together for this event,” Downing continued. The main focal point of the Earth Day Open House is the Native Plant Area (NPA), which is located on the northern end of the Park on the site where the San Diego River once flowed and was the site of the Kumeyaay village of Cosoy. The Native Plant Area was started in 2006 in partnership between California State Parks and the California Native Plant Society (CNPS). The purpose of the NPG was to recreate a usable, edible landscape similar to the one used by the Kumeyaay when the Spanish arrived in San Diego. Come Join Old Town San Diego State Historic Park at their Earth Day Open House! This will be a great family fun day, filled with interactive booths by State Parks, CalFire, Fish and Wild Life, State Parks Foundation just to name a few. California Native Plant Society will be hosting tours throughout the day and there will be kid’s games and crafts! Old Town San Diego State Historic Park Earth Day Open House is a FREE public event. For more information call Tim Downing at (619) 220-5422 or email tim.downing@parks.ca.gov. A great place to park is at the Caltrans lot on Taylor and Sunset. Visitors are encouraged to ride the San Diego Trolley to the Park. The Old Town Transit Center is adjacent to the Park.